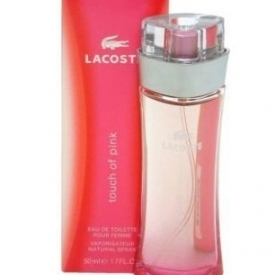 Lacoste Touch of Pink is a fruity floral fragrance, that is feminine, fresh and playful. Touch of Pink combines a playful burst of blood orange with the fresh sparkle of coriander, followed by sensuous, honest notes of jasmine and violet. The radiant prelude is prolonged by a refined dry down of sandalwood and completed by a dreamy, lingering kiss of vanilla. 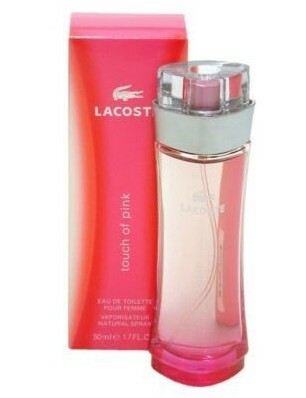 Lacoste Touch of Pink is an expression of magnetic and carefree sensuality. This scent is quite old now but will always stand the test of time in my opinion. The bottle is very feminine as is the floral/sweet scent. "This scent is quite old now but will always stand the test of time in my opinion. The bottle is very feminine as is the..."